I bring you glorious news from the sages of Darkshine! In addition to Divine Quests*, Mar`eth now delivers you a new type of Quest - Mar`eth Quests – which will test might, fortitude, and wisdom. Click the icon on the left side of your screen to view them in the Mar`eth's Abode interface! Mar`eth Quests are special, time-limited missions available to players from Level 15. There are three types of Quest: Daily, Weekly, and Monthly. Each Mar`eth Quest grants you a Reward that you must claim upon completion. Completing all the Quests of the Daily and Weekly Quests will earn you a bonus Reward! However, be vigilant – when Mar`eth Quests reset, unclaimed Rewards and your progress on incomplete Quests will be lost. 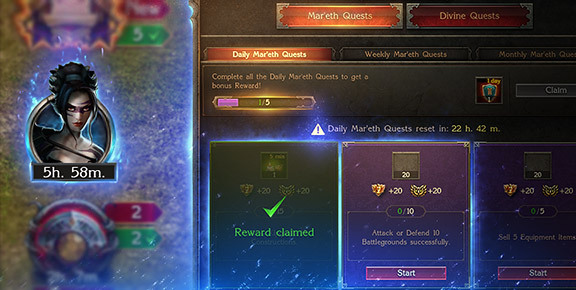 Daily Mar`eth Quests will be refreshed once a day, Weekly Mar`eth Quests every seven days, and the Monthly Mar`eth Quests every 28 days. Visit Mar’eth now and use this opportunity to its full potential! *To avoid confusion, the feature previously known as "Daily Quests" has been renamed to "Divine Quests". These are still available from the same interface and the feature has not changed.